Giveaway - Christmas in July - Cocoa Puffs Brownie Crunch Prize Pack (Ends 7/31 at 10:59 PM CST) | A Savings WOW! Visit Big G’s Grow Up Strong and Whole Grain Nation’s websites to find out more information about Cocoa Puffs Brownie Crunch Cereal and other Big G Cereals. 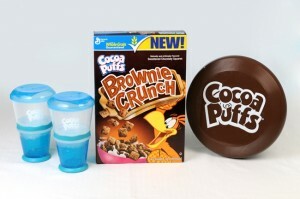 The winner of this giveaway will receive a Cocoa Puffs Brownie Crunch Prize Pack, which includes one (1) box of the new Cocoa Puffs Brownie Crunch cereal, two (2) cereal on-the-go containers and one (1) fun Cocoa Puffs frisbee. – (REQUIRED) Leave a comment letting us know how they plan to enjoy your Cocoa Puffs Brownie Crunch, even outside of the traditional breakfast setting. Reminder: Please leave a comment for EACH entry that you complete. One winner will be selected randomly from all entries received by 10:59 PM CST on Sunday, June 3rd. Disclosure: The Cocoa Puffs Brownie Crunch product, information, and giveaway have been provided by General Mills through MyBlogSpark. As a snack on the go. My little likes to munch on them plain for an afternoon snack! dry straight out of the box. I would eat it right out of the box as a snack. I’m cuckoo for Cocoa Puffs! It would be great to take along on car trips! I like A Savings WOW on facebook as Wendy R.
Following @maritramos on twitter as @ArtsyChaos. I would take them to work to snack on at break. I tend to like snacking on the just tastes so good! I now follow you on twitter as kmurble. I love taking dry cereal in the car – no mess, Cocoa PUff Brownie Crunch would be an awesmoe treat. My family would use this as a snack when on road trips. My family would eat these on a lazy day for breakfast! We would like it for breakfast. My husband would love these. He would eat them as a snack all the time. I sent out a daily tweet. I like to take a little bag of cereal in the car with us when we’re out running errands in case anyone gets hungry. My grandson eats his cereal dry. No milk. He will drink milk but does not like it on andy cereal. I’d snack on it right out of the box. We’re coo coo for Cocoa Puffs! My kids would enjoy this as a nice on the go snack. I would eat it with my kids for a meal or snack. I’ll eat it at night while watching a little television. It will be a great snack on the go for our many summer outings, and long car trips to visit family. I’m going to use ours as a snack, I’ll take it to the beach for a snack. My kids love snacking on dry cereal anytime of the day! Thanks for the chance to win! We are cereal with milk eaters, however, my cupboard of cereal tends to rival Seinfeld lately! I would take some to work as a mid day snack. In the car on the road! I like cereal as a snack just dry- and this one sounds yummy! These would make a great on the go snack! We’ll eat it in the car on the way to practice. I would enjoy these for breakfast and snacks, thanks! i know my husband will eat it straight from the box for a snack! I would like to make cereal bars (using marshmallows) out of this cereal, and eat it as a dessert as well. I’d eat it as a snack. I like to put cereal at the bottom of my kids ice cream cones. They absorb the ice cream and my kids get some healthy stuff from the cereal without realizing it! My family loves to go camping and I would love to take this as a snack. i would eat this while im on the computer :D.
I would like to enjoy Cocoa Puffs Brownie Crunch as an afternoon snack. My kids would enjoy Cocoa Puffs Brownie Crunch as and morning/afternoon/evening snack my kids love cereal and will eat it all day long. I would eat them as a snack at my desk at work. I would fill a small plastic container and take the cereal, along with a drink, to the park or just out in a walk with the stroller. I would eat these as a snack. in a ziplock as a snack. my son and i both drive to work and eat breakfast in the car or when we get to work so this woukd be an easy way for us to get our cereal to go with us both! This would be good to snack on at work between meals. I will enjoy these the traditional way with milk! You always have to have milk with your brownies! Thanks! I would share these with my Kindergarten and preschool students for a special snack. The girls would take them to school or work. I want to try them rice krispies treats style. This would be magnificent as a before bedtime treat! We like to eat cereal as a snack at night too. So we will eat the cereal as a snack too. I like to take cereal as my lunch!! This would be great! !